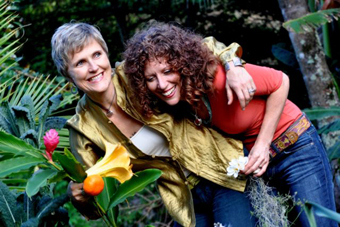 Lisa Ferraro & Erika Luckett are intent on amplifying the goodness, joy, and nourishment in the world. Lisa is a soulful jazz vocalist who grew up in Pittsburgh and has worked with such artists as Marvin Hamlisch, Hendrick Merkins, Roger Humphries, and Julie Bonk. Erika is an award-winning singer-songwriter and innovative guitarist who was born in Mexico and grew up in South America. The two began their musical collaboration in 2006 and have recorded five albums, including Sacred, On the Way of Love: Songs Inspired by Rumi, Awe, and Reflection. Their most recent album, Leaning Toward the Good, represents a bigger step. Erika and Lisa hope to help people connect to each other and to the larger world. Science of Mind Magazine calls them “fire and honey, lightning and gold” and praises their “music born of the earth and destined for the heavens.” Joining Lisa & Erika tonight will be Julie Wolf on accordion, Jackeline Rago on cuatro, percussion, and mandolin, Tammy Hall on piano, Donna Viscuso on flute, saxophone, and harmonica, Michaelle Goerlitz on percussion, and other special guests. Fasten your seatbelts, and get ready for takeoff!